Here is a podcast of this weeks spelling words. OK so this is a spoof to the last message posted on NCLB. I have ventured into uncharted territory again, Yes and it hurts. Well we started the long term discussion about what to do with all those file cabinet full of documents. Well at first it seem like a simple thing right. throw some documents on a scanner and place them on the server in a PDF format and walla presto magic you have document retention, HOLD ON THERE TEX. Come to find out there is public law passed on the retention times and how though shall store them. I will write another post soon on what the ANSI standards numbers are and where you can purchase them. Yes that is right they are copy righted and you must pay for the word for word verbage. If you want some people have summarized the Standards but if you want the fine detail you must purchase a copy for your records. If you ever wanted to know what kids think about NCLB here is your answer. This young man say what most adults can't so eligently why we need to do what is right for all student. Even if the political winds are possibly pushing us into the parels of the rock. We still need to make sure we are doing what is right for all students. Need to find research on instructional technology to see what the effect is on student learning. Here is a website that you can do searches on use of instructional technology in education. Please leave comments, I need your feedback on what you would like to see addressed at this blog. I see lots of hits here if nothing else leave a comment of where you are from so other people can see where all the viewer are coming from. Is it time to change the name of the Department of Technology to the Department of Learning? 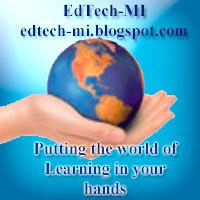 After listening to the Director of Technology Bruce Umpstead for the State of Michigan. It changed the way that I think about instructional technology. Mr. Umpstead talk about maybe it is time to change the director of technology talk about how maybe we need to rethink what we call now the Department of Technology. My superintend Dr. John “kip” Walker has challenged me a number of years back to think differently about technology, I think he said it this way, “Technology should not be used for the sake of using technology, but instead how is it going to effect student learning”. Since this we have try to make sure that every time we have a conversation about technology be it in School Improvement or technology committee meetings that we make sure we keep it in this context. Two years back we were setting the goals with teachers so we try this little exercise to help us all keep it in that context of student learning and outcomes. We had the sixty teachers break into groups of 5 or 6 they then took a 30”*40” peace of paper and wrote there priorities of technology and then had to come up with how each one would effect student learning. We then complied all the items and there outcomes and gave each of them 5 votes on there top five choices. This left use with a list where we picked the top 5 items that received the most votes. In doing this we also could see how the teachers planed to change student learning with these technology priorities. What was the outcome the number one item was Elmo document camera units for each room we obviously this moved the number two choice ahead of it Projection units for each room and then the third item was CPS units for all teachers. The next year we turn priority one into a reality by adding projection units to every instructors room. The buy in was overwhelming and all teachers had a good start by the time there units where mounted in how they would use this instructional technology to help student learning. We are now working towards the second part of the goal and with document camera prices dropping rapidly they are not far off from becoming a reality. We have a few units so that teachers can develop and model how they will affect student learning with are students. Only one week remains to file invoices with SLD for discounts on recurring services received during the 2007-2008 fiscal year. Next Tuesday’s October 28th invoice deadline applies to both applicant BEARs (Form 472s) and service provider SPIs (Form 474s). Just in case any of you were panicing today or tonight because you thought you missed the deadline here it is. Last year it was 10/20/2007 I was panicing today when I could not find the date and then I seen a message with this date in it tonight. Good luck and 470 time is just around the corner.